"The time has come for our European partners to stand with us," Pence said. 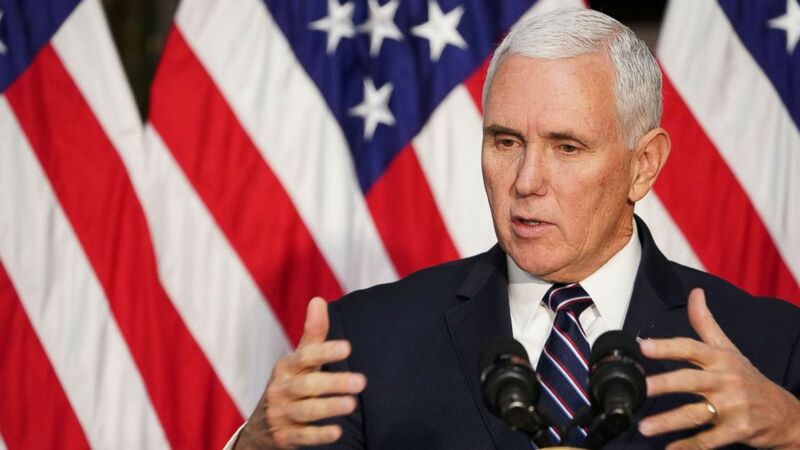 Vice President Mike Pence urged European nations Thursday to follow the U.S. in withdrawing from the Iran nuclear deal, and said that America could impose tougher sanctions on the Iranian regime. “The so-called Joint Comprehensive Plan of Action (JCPOA) did not prevent Iran from obtaining a nuclear weapon. It merely delayed the day when that vile regime would gain access to the world’s most deadly weapon,” Pence said while addressing world leaders at the U.S.-sponsored Middle East peace and security conference in Warsaw, Poland. Calling the Iran nuclear deal “disastrous,” Pence said several countries agreed that Iran had become more aggressive since JCPOA was signed, not less. In 2018, President Donald Trump withdrew the U.S. from the landmark 2015 nuclear accord -- despite concerns from other world leaders -- and imposed economic sanctions on the country. The Trump administration is now calling on other European leaders to do the same. “Sadly, some of our leading European partners have not been nearly as cooperative -- in fact, they have led the effort to create mechanisms to break up our sanctions,” Pence said. The vice president specifically referenced Germany, France and the U.K., whose leaders announced earlier this year the creation of a financial mechanism to oversee transactions between EU businesses and Iran without risking U.S. sanctions, according to the Associated Press. “They call this scheme a ‘Special Purpose Vehicle.’ We call it an effort to break American sanctions against Iran’s murderous revolutionary regime. We call it an ill-advised step that will only strengthen Iran, weaken the EU and create still more distance between Europe and America,” Pence said. France and Germany attended the conference in Poland, but did not send their top diplomats. 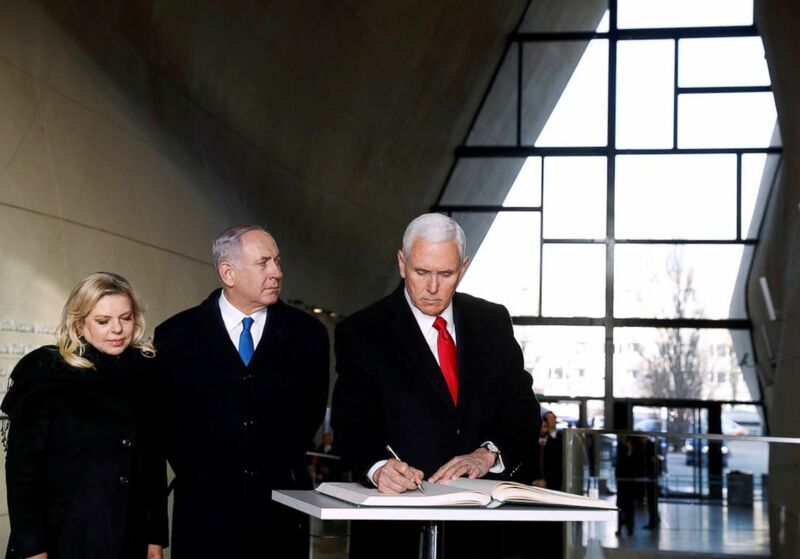 (Kacper Pempel/Reuters) Vice President Mike Pence, Israeli Prime Minister Benjamin Netanyahu and his wife Sara visit the Jewish Museum in Warsaw, Poland, Feb. 14, 2019. With the administration’s continued emphasis on its “America first but not American alone” policy, the vice president made a plea for other countries to join the U.S.
“For the sake of peace, security, stability and human rights in the Middle East, the time has come for our European partners to stand with us, stand with the Iranian people, stand with our allies and friends in the region -- and we reject the Iran nuclear deal,” he said. Secretary of State Mike Pompeo, who attended the event, said that standing up to Iran is necessary. “You can't achieve peace and stability in the Middle East without confronting Iran. It’s just not possible,” he said. Foreign ministers and representatives of 62 nations attended the conference. However, official representatives from Iran were not in attendance. (AFP/Getty Images, FILE) Vice President Mike Pence speaks during an event at the Eisenhower Executive Office Building next to the White House in Washington, Nov. 29, 2018. 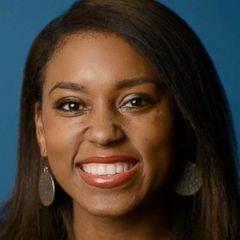 A White House official told ABC News the administration is not ruling out a possible new Iranian nuclear deal, but it would need to include tougher sanctions. Pence is expected to visit Germany next for the Munich Security Conference, where he is likely to address the ongoing tensions in Venezuela.